Geoffrey Chaucer tells the Canterbury Tales for the first time at the court of Richard II. Birth of a short-lived child to George, duke of Clarence, and his wife, Isabel Neville, on a ship off Calais. Some sources say that it was a boy, others that it was a girl named Anne. This was their first child. Birth of Leonardo da Vinci in Vinci near Florence. Famous as a painter and inventor, scientist and lots more. He was a contemporary of Richard III, being just six months older. He died on 2 May 1519. Battle of Barnet, Hertfordshire, defeat of Warwick and his brother Montagu, who both fell in the battle. Richard is said to have been in command of the vanguard. Read more about a possible different location for the battle here. Birth of Margaret of York, fifth child and fourth daughter of Edward IV and Elizabeth Woodville, at Winchester Castle. She was named after her aunt, Margaret Dowager Duchess of Burgundy. She died at the age of 8 months on 11 December 1472, buried at Westminster Abbey. Her sarcophagus was originally placed to fit in the steps of the shrine of St. Edward the Confessor but later moved to the edge of the chapel. The step edging around the sides can still be seen. Edward IV dies at Westminster, buried at St Georges Chapel, Windsor. It is assumed that he named his brother Richard, Duke of Gloucester, as Lord Protector of England during his son Edward’s minority. 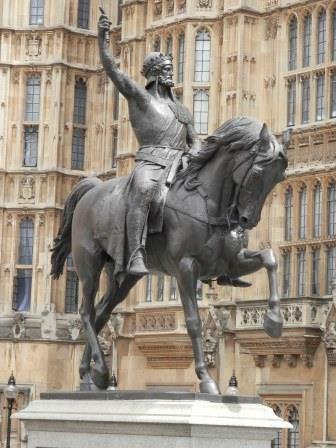 Richard I (the ‘Lionheart’) dies from an infected arrow wound to his shoulder. He received this by accident while besieging the small, virtually unarmed castle of Chalus-Chabrol. Richard was born on 8 September 1157, the third son of Henry II and Eleanor of Aquitaine. He was crowned King of England on 3 September 1189. Richard spend only 6 months of his reign in England, first going on the Third Crusade, on his return he was imprisoned in Austria. His mother worked hard to raise the ransom of 150,000 marks (65,000 pounds of silver) equaling 2–3 times the annual income for the English Crown at that time.